SKU: LGCAP. Categories: Log Caulk, Perma-Chink. Tags: gap cap, gap caps, lgo cap, lgo gap, log cap, log caps, log gap, Log Gap Cap, log gap caps, log gpa. Log Gap Caps increase energy efficiency. The medium size is designed to work with most 6”-8” diameter logs, the large size is designed to work with most 9″-11″ diameter logs. The pre-cut Log Gap Cap’s uniform shape fits most log profiles reducing air infiltration where round logs meet window and door trim. Please note that there are so many log profiles available these are fit guidelines, not absolutes. 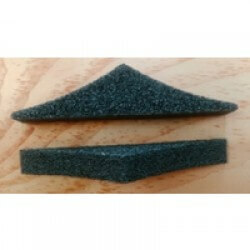 To use with log SIDING applications, please refer to Log Gap Caps for Log Siding. Log Gap Caps are constructed of material resistant to mold, rot, bacteria, and will not absorb moisture. Engineered from ¾” closed cell flexible foam, a Log Gap Cap compresses and remains in place with little caulking required. Seal over Log Gap Caps with Energy Seal Caulk to virtually stop any water or air infiltration, if desired. Be the first to review “Log Gap Caps for Full Logs” Click here to cancel reply.